Try a Brand New Reader! What makes a book right for first-time readers? New readers should be able to read a book successfully the first time they try. That means short, simple stories written and illustrated so clearly that new readers cant help but succeed. Even the easiest books have to be worth reading. They have to be interesting and fun. They have to reward the childs efforts to read. They have to inspire him to read -- and reread. Brand New Readers have real stories with beginnings and endings. They feature lovable, mischievous, multicultural characters that kids will want to follow from book to book. The action takes place in simple, one-line-per-page, eight-page stories that are short enough to give children the satisfaction of reading a whole book in one sitting. To make reading success even more certain, weve included a brief but clear introduction to the story inside the front cover of every book. You can read this aloud to your students, then look through the book together to prepare them for reading independently. 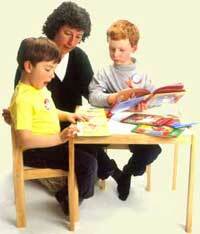 Youll find further simple suggestions for making reading easy and fun for children in the back of each book. They assure reading success, promote literacy, and will stand up to real-life classroom use. Each series of eight stories comes in two sturdy cardboard slipcases, four books in each. Brand New Readers are easy to display or store and are just right to send home in backpacks. With you and your budget in mind, weve priced Brand New Readers at just $5.99 for four books! Compare this to what you must spend to purchase packs of 30 or more titles from educational publishers reading schemes. With Brand New Readers, you get to choose which titles to buy and how many. Also available are sturdy hardcover editions of each set of four stories -- just $12.99 each! With the help of books that are just right, children become eager and confident readers, and we all know how important that is. It makes everything else easier. And what, finally, could be better than seeing a child who is proud to be a reader? advice to help you guide and support brand-new readers! Read Brand New Readers aloud and ask children to help with words they know or can guess by following the pictures. Often you will find that -- by design -- when children describe what they see pictured in a Brand New Reader, they have also spoken aloud the text! Point this out and watch amazement and pride light up their faces. Suddenly, reading doesnt seem so hard. In fact, theyre already readers! Encourage children to extend the stories with their own writing and drawing. Ask them what might happen to the character after the story ends. Your students may even want to write their own eight-line stories about their favorite characters. 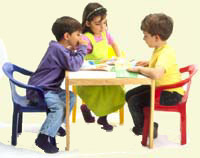 Organize a readers theater and encourage children to act out the stories in the books. Because Brand New Readers feature short and memorable stories, children can -- with little preparation or practice -- transform these stories into their own little plays. Kids may also want to make up plays that put the characters from the series into imagined situations. Encourage children to read Brand New Readers aloud to younger siblings, parents, and grandparents to show off their emerging reading skills. Create flannel-board stories based on stories in the series. How else can Brand New Readers help in the classroom? We cant wait to hear your ideas! Click here to TRY A BRAND NEW READER!